BLUSHING BECKY, importada, ganhadora e com sangue de Magic Cross(Blushing Bug) pros filhos de Dash Ta Fame. Seu pai BLUSHING BUG: AAAT-108 (1983). Ganhador clássico com 13 vitórias, US$ 185,573, 1o. Champion Prep. S., Carlsbad H., 2o. QHBC Sprint Classic-G1, HQHRA Champ.-G1, Kaweah Bar H.-G3, Duoble Bid H.-G3, 3o. Pomona Invt. H.-G2. Pai de : BLUSHING BY (AAA-97, 7 vits., 1o. Independence Day H. (R), etc. ), BLUSHING SIXTEEN (AAA-99, 6 vits., 1o. Fresno Fut., etc. ), RUNNIN SONOFA BUG (AAA-98, 11 vits., 1o. Monor Downs 550 S.) BLUSHING SUN (AAAT-102, 4 vits., 1o. Freshman H., etc. ), Blushing Doc (AAA-98, 4 vits., 3o. Blu Ribbon 440 D.-G3), Alotta Bugsy (AAAT-104, 3o. Josie's Bar H., etc. ), entre outros clássicos. * SHOW ME YOUR TOOLE si 99, 4 wins to 3, 2009, $381,419, Dash For Cash F.-G1, 2nd TQHA Sale F.- RG1, 3rd Sam Houston F.-G1, 4th Harrah?s Ent. F.-G2, 5th Firecracker D.-G3. * GOL si 101 [c., By Yawl]. 6 wins to 3, $371,538, Heritage Place F.-G1, Retama Park F.-G1., 2nd Hill Country H., 3rd Barnmaster Sprint S., Satsuma S.
* PHOEBES OTOOLE si 103 [g., Runaway Winner]. 8 wins to 7, 2009, $370,976, Heritage Place F.-G1, Speedhorse Gold & Silver Cup F.-RG2, Develop A Plan S., Royal Bushwacker S., 2nd Streakin La Jolla S., etc? * JODYS MONEY POP si 106 [c., Man In The Money]. 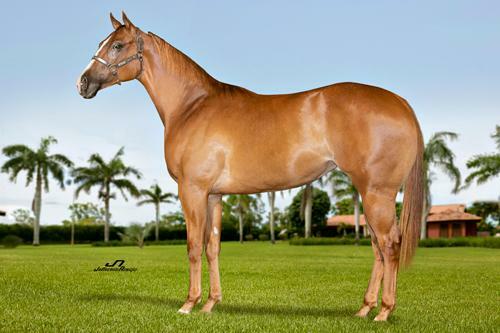 5 wins to 3, 2009, $262,888, TQHA Sale F.-RG1, Tx. D. Chal.-G3, 2nd Texas Twister S., 3rd W. Tx. F.-G1. Remington Park D.-G1, MBNA Am. Okla. Chal.-G1, Sam Houston Cl.-G2, Woodlands Champ. H., etc., Ntr DED 440yds.